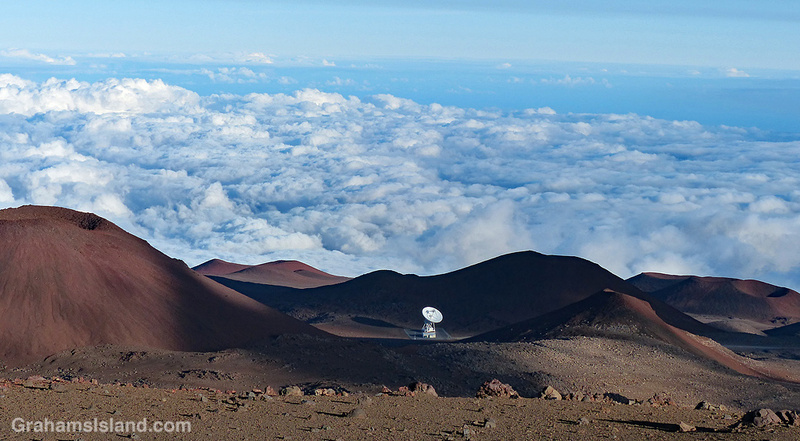 Most of the telescopes on Mauna Kea are clustered together near the summit, but about halfway between the Mauna Kea Visitor Center and the summit is this lonely telescope. It’s one of the ten radio telescopes that make up the Very Long Baseline Array (VLBA), which began operating in 1993. Eight of the other telescopes are scattered around the U.S. mainland with the tenth at St. Croix in the Virgin Islands. The Mauna Kea telescope, like the others, consists of a dish antenna 82 feet in diameter, and an unmanned control building. These ten telescopes are remotely operated from the Domenici Science Operations Center in Socorro, New Mexico. For more information about the Very Long Baseline Array, go to https://public.lbo.us/.